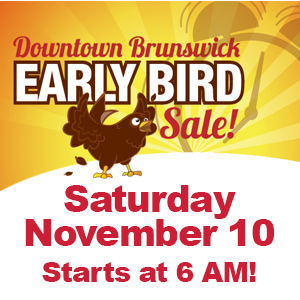 Brunswick Downtown Early Bird Sale starting at 6 am, Saturday, November 10th. Exciting sales discounts and specials offered by more than 18 Brunswick Downtown businesses. Wear your pajamas and SAVE! As You Wish Party Supplies, Planning and More! *This excludes all sale items, gift certificates and CBD items. Anyone clad in PJs qualifies for a pair of bird earring, handmade and painted in Africa! Cider and treats will be provided. All day Free Shipping. Mail order may be postdated to ship out anytime during the holidays. Must fill out mail order form and pay for purchases on Nov 10th. Excludes Sale Items. *Off purchase of gift cards only. $10 minimum. Broadway Deli – Free coffee, tea, & cocoa! Starting at 6:30 AM. 20% Off: All Arrangements & Chocolate Dipped Fruit Boxes ordered on 11/10/18*. Free “apple donut” for anyone in the PJs. Pajama wearers will receive a “special” gift with their purchase. *It’s your one chance per year to have God of Thunder coffee in the morning! We’ll also offer $5 holiday bonus cards for every $25 in gift cards purchased during Early Bird hours. Raffle Drawing ~ Fill out your Holiday Wish List to Enter to win a $75 Gift Certificate.